Are you interested in leasing Bridgetown’s oldest building and/or redeveloping an iconic site on the banks of the Blackwood River? 2. to redevelop a portion of the site on Hampton Street. 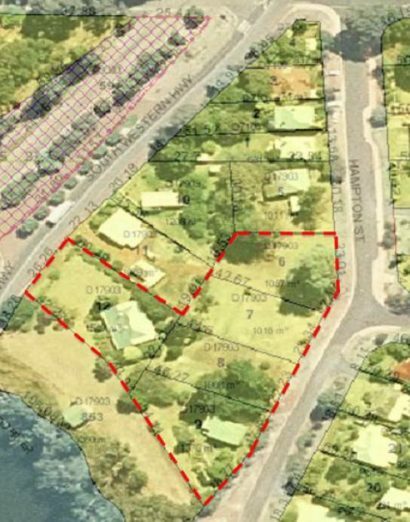 The lots situated on Hampton Street are subject to regulatory approvals and could be developed for a range of commercial, entertainment or tourism uses. Bridgedale will be open for inspection on Thursday 6 December between 12pm and 2pm to enable interested parties to view the place. Bridgedale was established in 1859, pre-dating the town. The c1863 house remained the residence of the Blechynden family until the 1950s. The nine-roomed c1868 house is of locally made brick construction with a galvanised iron rooms and wide verandas. The residence faces Hampton Street and its rear gardens extend southwards to the Blackwood. The National Trust of Western Australia is chartered to protect and promote the heritage values of this important heritage place and recognises the optimal way to achieve this is through supporting sustainable activities and uses at the site. Bridgedale is ideally located at the southern entrance to Bridgetown and offers a range of opportunities to capitalise on its landmark status. Option B – Redevelopment of a portion of the site on Hampton Street for commercial, entertainment or tourism use. Bridgedale is a residential building and with its picturesque outlook lends itself to low-impact uses such as tourism or creative industries. It is listed as inherit database Place Number 0241 – State Register of Heritage Places and under the Shire of Bridgetown-Greenbushes Town Planning Scheme (TPS No.3). Any proposed use will be subject to Council approval. The National Trust of Western Australia will consider expressions of interest proposals against criteria including: financial sustainability; community benefit; and potential impact on heritage values. Compatibility with site and heritage values. 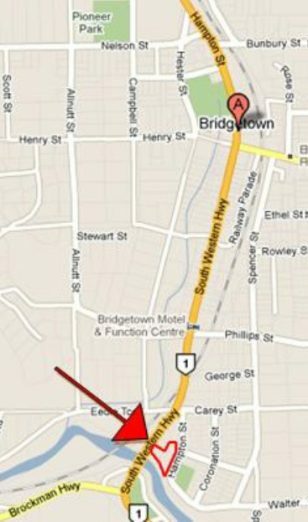 Bridgedale, Bridgetown has a close association with the first years of European settlement of the Bridgetown district. The original ten acre site of the place was purchased by John Blechynden in 1859 under the newly introduced land regulations aimed at promotion of wider settlement of rural districts in the south-west of the State. The farm at Bridgedale was the first property to be occupied in the townsite area and pre-dates the establishment of the town. The existing house was built circa 1868, and is the oldest building in Bridgetown. When the Bridgetown townsite was proclaimed in 1868, Bridgedale was incorporated into the town survey. As the town developed and expanded Bridgedale became a town residence rather than a homestead. Its farming origins, however, remain apparent. Bridgedale remained the family home of the Blechynden family until 1950. Bridgedale was saved from destruction by the efforts and generosity of the local community who raised the funds to purchase the property in 1970 and subsequently gifted it to the National Trust. In the early years of the town’s history, it was the focus of community gatherings with public meetings, school classes, concerts and dances being held either in the house itself or in the large barn on the property. A use is sought that that enables the community to once again access and appreciate the heritage values of Bridgedale. 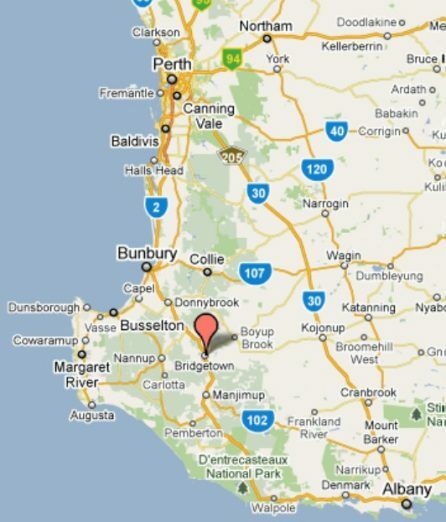 Bridgetown is located in the heart of WA’s south-west three hours’ drive south of Perth and an hour and a half drive east of Margaret River. Bridgedale is located at the southern end of the town, between the South-Western Highway and Hampton Street, on the northern banks of the Blackwood River. The site has access on the west to the South Western Highway and on the east to Hampton Street. Looking south from the property there are pleasant views over the river and the bridges to the valley landscape of cleared hillsides with scattered trees. Nearby attractions include: Bridgetown Pottery Tearooms and Gallery; Brierley Jigsaw Gallery; Greenbushes Eco Cultural Discovery Centre; Levanda Grove; and The Cidery. 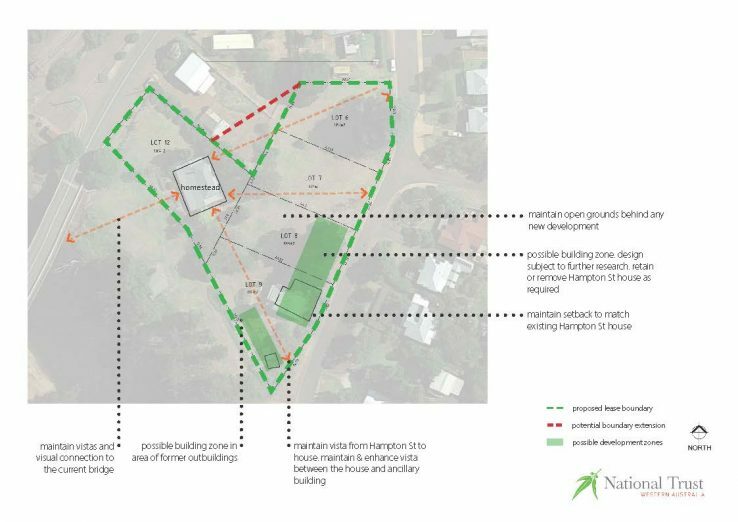 The site area comprises five lots: Lots 6 (1057m2), 7 (1016m2), 8 (1008m2) and 9 (1370m2) of Diagram 17903 are located at 1, 3, 5 and 7 Hampton Street respectively; and Lot 12 (1549m2) on Diagram 17903 is located on South Western Highway. Together, they comprise 6000m2 (0.6 hectares) of the original Blechynden land holding. Lot 9 contains a c1950s house that is on a fixed term lease. The remainder of the lots are available for lease immediately and are on offer as options A and B and subject to heritage conditions development opportunities. 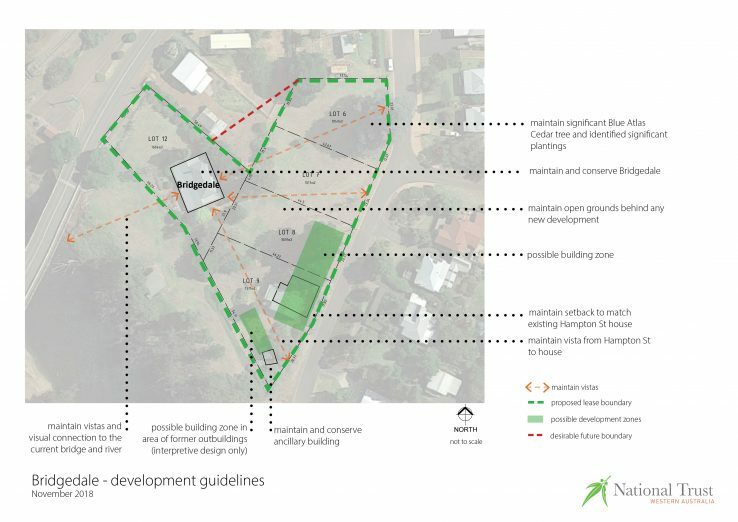 Option A – Find a sustainable and compatible new use for Bridgedale Homestead. Bridgedale is a single storey four roomed clay brick house in the Victorian Georgian style with a simple corrugated iron hipped roof, bull nosed verandas to three sides, and a skillion-roofed rear section comprising five rooms. 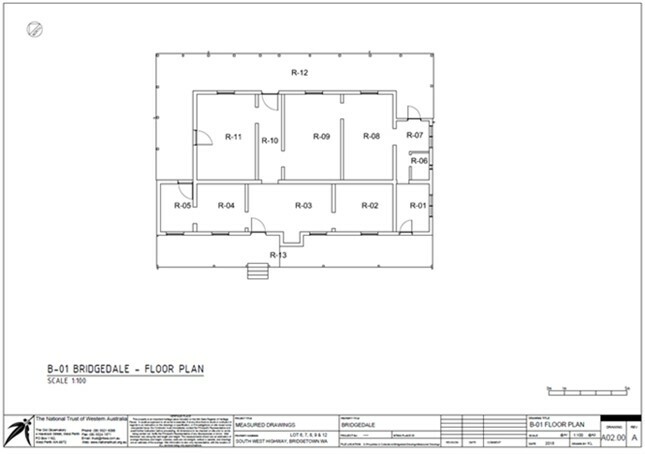 The internal floor area is 135m2. Internally rooms are generally floorboards on stumps, painted mud render on clay brick walls, timber joinery and timber board ceilings. Washrooms are concrete slab floors with an unlined ceiling. There are fireplaces in three rooms and picture rails in formal rooms. The house has a split level reflecting the stages of construction and existing site levels. The phases of development of the building remains apparent through its physical fabric: the lean-to roof section to the south west has less sophisticated detailing than the front rooms and entry hall. The c1960 additions on the eastern side are also readily apparent. Generally the building is in fair condition with elements in poor condition. Although much restoration and conservation work has been completed in the past forty years, it is of a medium to high authenticity and integrity. 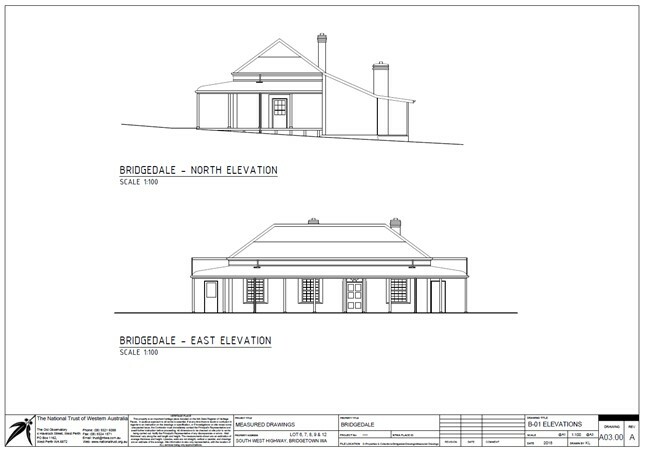 As per the ‘Bridgedale, Bridgetown WA: Conservation Plan’ (revised) 2013 – Work required to enable use of the building includes: electrical upgrade, toilet and kitchen upgrades, painting and general repairs. Universal access and other compliance issues will be dependent on use. Option B – Redevelopment of waterfront portion of the site on Hampton Street for commercial, entertainment or tourism use. The land on which Bridgedale is set slopes moderately steeply down from Hampton Street in the north-east down to the northern bank of the Blackwood River in the south-west. The existing landscape comprises expansive areas of grass (both irrigated and unirrigated), mature trees, shrubs, and beds of herbaceous perennials. The overall presentation is of the buildings and their fringing domestic gardens sitting within a park-like setting. Trees are of mixed, mainly introduced species except for the river bank which retains its natural Eucalypt vegetation. The most historically important tree is the large Blue Atlas Cedar (Cedrus atlantica glauca) at the north-east corner of the site, believed to have been planted toward the end of the nineteenth century. Bridgedale is classified by the National Trust of Western Australia, in the Shire of Bridgetown Greenbushes Town Planning Scheme and Municipal Inventory, and included on the State Register of Heritage Places.